Not to dwell on the topic of smells too much, but they are so important to the design of a space–with an inspired wall color, sumptuous fabrics, chic candles, a cool playlist, and good hors d’oeuvres, a guest is using all five senses to experience your home! 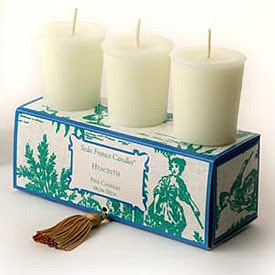 In my opinion, Seda France makes the most amazing candles on the market. 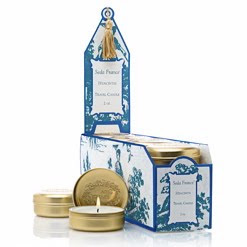 The signature Pagoda Box candles come in a wonderful variety of scents, so there is definitely a scent for everyone. Hyacinth is by far my favorite. 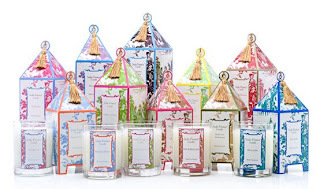 At a cost of only $32, these candles undercut much of the “candle competition,” and they’re the only candle whose packaging is a decorative objet in itself. 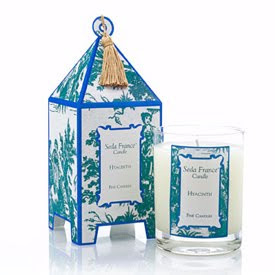 The chic chinoiserie box with its gold tassel is too pretty to throw away — the packaging for my Hyacinth candle lives on a shelf in my bathroom and adds a nice hit of teal to the space! There are even travel sized candles, on sale individually for $6, which make wonderful stocking stuffers, and travel extremely well for those instances where a hotel room doesn’t quite feel like home. Obviously these don’t come with a box, so I would always advise buying the votives if you are planning on using it in your home — you get a little more for your money. 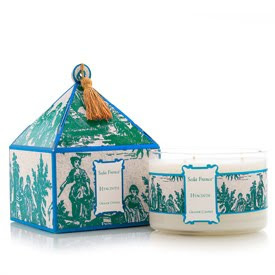 Finally, for those of you who have the money to spend, and who love Seda France as much as I do, this three-wick candle, at a cost of $42, is the one for you! With a burn time of over 70 hours, this candle will be scenting your environs for many evenings to come. Happy Smelling!